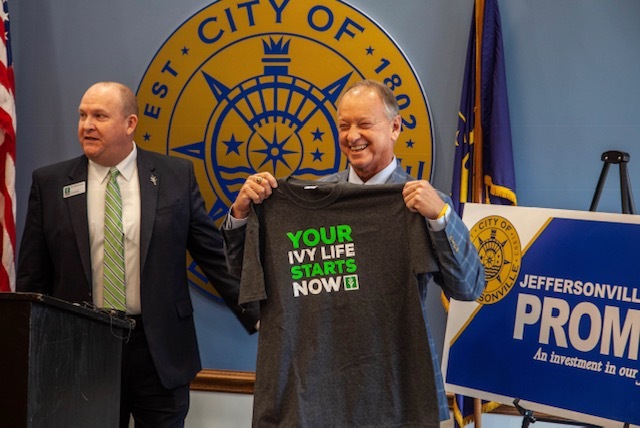 Jeffersonville Mayor Mike Moore announced the city is entering into a partnership with Ivy Tech Community College to offer scholarships to every Jeffersonville High School graduate that will allow them to earn a two-year college degree. Jeffersonville High School graduate from the Class of 2019 and those classes thereafter. Students who have earned a minimum of a 2.0 high school GPA and maintain a 2.5 GPA while enrolled while enrolled at Ivy Tech. Students who have completed the FAFSA. Enrolled in credit-bearing and workforce-focused courses towards attainment of a certificate, certification or degree at Ivy Tech. Students must enroll at Ivy Tech during the Summer, Fall or Spring term after their commencement from high school starting in Fall 2019. The City of Jeffersonville, through its Redevelopment Commission, will commit $150,000 of Tax Increment Funds (TIF) per year over the next five years to fund “Jeffersonville’s Promise.” The program will be administered by Ivy Tech and is intended to be a last dollar scholarship; meaning students must first accept all federal aid, local aid and other scholarships. The City of Jeffersonville has previously committed over $400,000 of TIF dollars per year to Greater Clark County Schools. “Jeffersonville’s Promise is just the next step in our strong commitment to improving education and workforce development,” said Moore.